Match-3 Games for Halloween Artykuł - Zwykłe Darmowe Gry! Oceń ten Artykuł While the younger kids are out trick or treating, maybe you could kick back and relax with some amazing Halloween-themed match-3 games that we’ve dug up specially for you this upcoming Halloween. Halloween’s just around the corner. If you need some fun match-3 games to get you into the mood for the Trick or Treating that’s about to come, we might just have the game for you! Band up together with witches to stop the servants of Lucifer from using the stolen Stone of the Dead to open the gates of Hell, unleashing unspeakable horrors into the realm! With many levels of match-3 action to enjoy, 9 different locations to explore and a nice home customizing feature, Save Halloween: City of Witches, is definitely THE match-3 game to play this Halloween season. Do you have an eye for landscaping? Well, if you do, the Queen needs your help! Play over 130 levels of fun and challenging match-3 games to earn enough cash to buy plants and decorations. Transform the Queen’s plain-looking garden into one of the spookiest Halloween garden ever in Queen’s Garden Halloween! #4 Defeat Adorable Monsters This Halloween! Halloween is not only the season where binging on candies and chocolates is acceptable; it is also the season where all manner of monsters come out to play... and yes, even the shy ones! Have fun playing with some of the friendlier monsters like the ones in Paint Monsters or help some darkness-loving and cute monsters destroy all the shiny jade tiles (They are just TOO shiny!) in their little temple in Monster Temple. However, there are unfortunately more mischievous and sometimes downright malicious monsters, in their adorable-sort of way, as compared to the good ones. For instance, in Catch Monsters, you’ll need to help your client to retrieve his prized carrot treasure from a monster who somehow have an odd penchant for anything “carrots”. Or, your help may be needed to help some poor gingerbread men who were kidnapped by monsters and brought over to the monsters’ tower. Bust some monsters’ butts in the Monster Busters series: Monster Busters, Monster Busters: Hexa Blast, and the more recent, Monster Busters: Link Flash. Last but not least, you can go “awwww” at the cuteness of the baby monsters at the same time as you collect as many of them as you can in order to save CartoonLand from being overwhelmed in these 2 amazing match-3 games, Monster Toons and Monster Toons 2. Are you feeling ghoulish instead? Here are some spooooky match-3 games that features a myriad of ghosts, both the creepy and the Casper-cute sort! Love the Ghostbusters movie and can’t get enough of those amazing ladies? Well, join a team of professional Ghoul-catchers and go bust some scary ghosts’ behinds in this match-3 game, Ghoul Catchers. Use fun power-ups like Ghoul-be-gone to aid you in your quest to banish these malicious spirits from the haunted house. 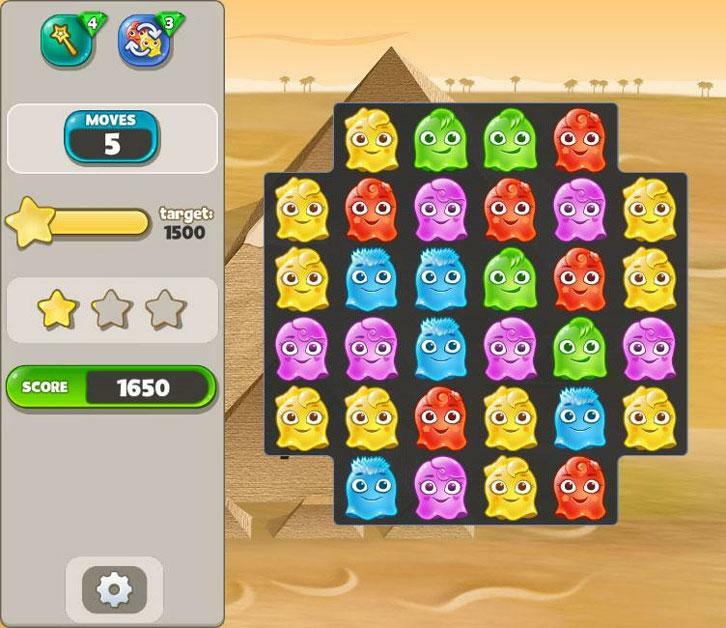 However, if cute ghosts are more of your thing, you can enjoy Oh My Ghost, a match-3 game with amazingly adorable ghosts and a slightly different gameplay. In Spooky Bonus, you can not only play exciting Halloween-themed match-3 games by matching skulls, eyeballs, witches’ hats, cauldrons, ghosts and more; you can even collect the scariest objects at the end of every stage you play and use them as decorations for your own spooky home. A list of match-3 games will never be complete without some candies and jewels, so to round all of this up, we present to you 2 more Halloween-themed match-3 games, Mo Candy Creeps and Jewel Match: Twilight. In Mo Candy Creeps, you’ll get to slide and match a variety of adorable Halloween candies and other sweet treats, like candy corn, Frankenstein jellies, Dracula berries and devil cherries, in a game where its background features skeletons, cobwebs, jack-o’-lanterns and a haunted house. Looking for something shinier instead? 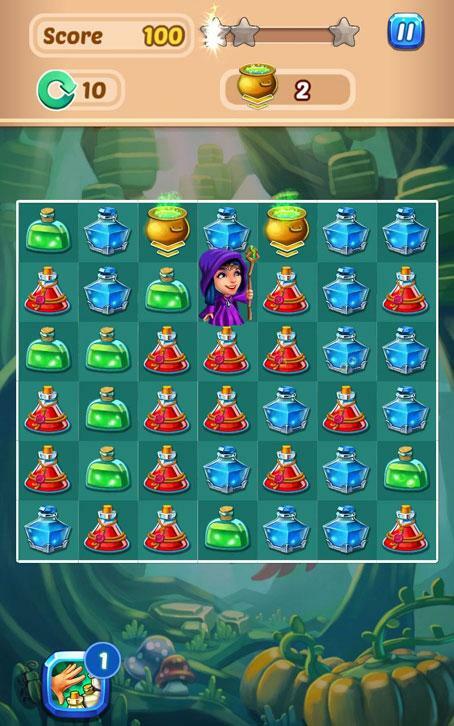 Check out Jewel Match: Twilight on Big Fish Games! With delightfully creepy visuals, 3 different game modes (including both relaxed and timed modes) and a nice selection of power-ups, you’ll be matching your way through eerie castles and other infamously haunted places filled with spooky creatures that are out to get you. If any of these match-3 games catches your fancy, simply click the link to head over to the review page. Give yourself the “treats” that you sorely deserve and treat yourself to some of these amazing Halloween-themed match-3 games this Halloween season!